Is everything about me? From antiquity, there was power of knowing the names of things and naming the world. The way we use names and identity are changing in society, from the decline of the signature to having multiple online identities under different names. This might be important because while we take our names for granted, nominative determinism suggests we can be subconsciously influenced by what our names suggest to us and who we become. Psychologically, there is further evidence to suggest that we don’t even need to see our whole name to be influenced, and that our choices can be influenced by only a few letters in common with others. This discussion focuses on our sense of self and how we construct that. The name letter effect refers to unconscious priming based on one’s name that may influence behaviour. “Because most people possess positive associations about themselves, most people prefer things that are connected to the self (e.g., the letters in one’s name)….Research on unconscious self-enhancement—or what we call implicit egotism—suggests that people’s positive automatic associations about themselves may influence their feelings about almost anything that people associate with the self”. (Pelham et al. 2003, 800). For example, implicit egotistic people are disproportionately likely to live in places whose names resemble their own first or last names (e.g., people named Louis are disproportionately likely to live in St. Louis). The same study also suggested that people disproportionately choose careers whose labels resemble their names (e.g., people named Dennis or Denise are over-represented among dentists). Balancing this positivity is that some people hold negative thoughts and associations about themselves. (Swann, 1987, 1996; Swann, Pelham, & Krull, 1988). It has been suggested that these types of psychological processes are part of a cognitive or adaptive unconscious (Kihlstrom, 1987) . This is not a theory that has gone unchallenged, with the concerted critique of the significance of the name-letter and implicit egotism by Uri Simonsohn (2010, 2011) who has challenged the use of statistics and assumptions behind the Pelham, et al studies; suggesting ‘they are most likely caused by a combination of cohort, geographic and ethnic confounds, and reverse causality’. In the world of ideas, to name something is to own it. If you can name an issue, you can own the issue. While aspects of Simonsohn’s critique are in part persuasive, there have been numerous other studies that have been inspired by this field and support findings of implicit egotism that was defined by Pelham, et al. This has continued to evolve the methodologies approached, and tested this psychology from a range of different contexts, cumulatively indicating something is at work here. Nuttin (1987) found that that there was a preference for letters in the alphabet like their own for people using 12 different European languages. This suggests that there is less of a cultural bias present in this thinking, that his is something true to all humans. From the perspective of implicit egotism people should gravitate toward others who resemble them because people who are similar to themselves reflect positive, automatic associations about themselves. (Jones, et al, 2004) has suggested that people are disproportionally likely to marry others whose first or last names are like their own. The inverse is also true, with a darker side of people eschew unfamiliar names (Widner, D., & Chicoine, S. 2011); resulting in us unconsciously pushing away from others. In another study by Anseel and Duyck (2009) linked name-letter preferences in job-choice intentions for final year students. ‘thus, while the name letter effect may be beguiling, our data suggest that the effect is at best elusive or non-existent. The last name does not appear to affect the time that students sign up to take the exam, and it is not yet well supported that one’s own name can affect the grades he or she earns. Nevertheless, it has been well documented elsewhere that names can affect unconsciously one’s behaviours and beliefs. Hoorens and Nuttin (1993) found that consumers prefer brands that have the same initials as their own last names, possibly because people’s preference for themselves is extended to their possessions. (Brendl, Chattopadhyay, Pelham, & Carvallo, 2004) found that people prefer products (e.g., teas, crackers, chocolate, candies) whose names share one or more letters with their own names. Indirectly related, Finch and Cialdini (1989) had participants in a study read a negative biography of Rasputin of Tsarist fame. Half the participants were told his birthday was the same as theirs, the other half were told nothing. Those that shared the same birthday were more positive about Rasputin. (Finch, J. F., & Cialdini, R. B. 1989.). This suggests that there are other ways that implicit egotism might be affecting our behaviour. It is interesting to consider the recent global Coke campaign, where over 150 names were put into many markets. 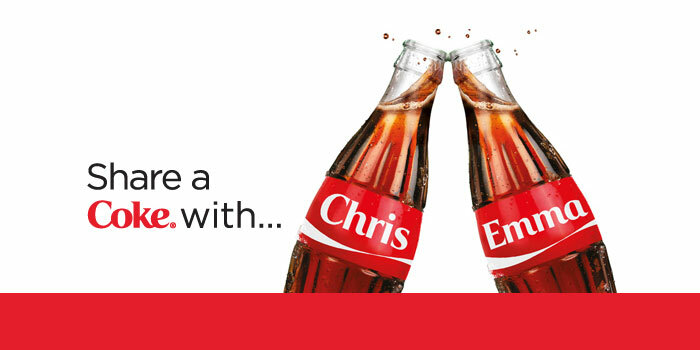 The positioning was about sharing a Coke with others. It would be interesting to see if part of the engagement with this campaign were people seeking out their own names as a form of implicit egotism. Perhaps this exploration of the roles of names in culture and our psychology offers something closer to what Carl Jung was trying to define in his book Synchronicity when he stated that there is ‘sometimes quite grotesque coincidence between a man’s name and his peculiarities’. Synchronicity is best defined as ‘meaningful-coincidence’. This is to admit that some events are coincidences but these can still be meaningful. However, there does appear to be some causation and evidence this is not necessarily conclusive or explanatory of everyone. At best it is a refutation of the maxim ‘familiarity breeds contempt’ when it comes to ourselves, we are a egocentric species. More broadly, these studies don’t explain what happens to all of those that don’t have names to read meaning into, or those that don’t have professions that relate to their names or the letters contained in their names. those of us with names at the alphabetical tail W X Y & Z will never get ahead !